Courtesy of Biofase, Morelia, Michoacán, Mexico. Doug Woodring in Hong Kong, Ingemar Patiño Macarine in the Philippines and Bruckner Chase in the United States like other open water swimmers in groups and as individuals, online and on the beach, swimmers are doing their best to reduce plastics in the world's oceans. 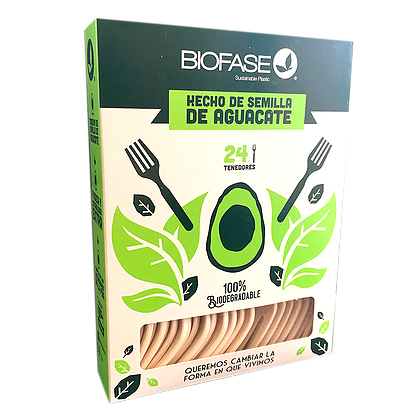 Biofase, a Mexican company based in Morelia, is manufacturing biodegradable knives, forks, spoons and straws made out of avocado seeds. Scott Mungía was motivated to solve pollution problems and started to look for a reliable source for biodegradable plastic. The creative chemical engineer tested a number of raw materials like mango and mamey sapote seeds and then was inspired by a photo of the corn molecule that was used to make bioplastic. "I already knew what the avocado seed molecule looked like," recalled Mungía. After two years of development and capitalizing on the annual Mexican production of 136,077 kg of avocados, Mungía and his colleagues can produce 700 tons a month of the biodegradable cutlery. Because the annual Mexican production of avocados represents 50% of the world's supply, avocado seeds present an ongoing supply of raw materials for Biofase - especially since up until now, most seeds are eventually burned at landfill sites. Munguía’s avocado-based bioplastic started when he finally figured out how to extract a molecular compound from the avocado pit to obtain a biopolymer which Biofase then molds into knives, forks, spoons and straws. Incredibly, the cutlery bio-degrades after 240 days of being exposed to the elements or buried in the ground. Marine conservationists compare this 240-day natural degradation process to over 100 years required to decompose plastics produced by fossil fuels. Munguía's process was patented in 2013 and Biofase now manufactures 100% biodegradable eco-friendly plastic resins as raw material. By 2016, Mungía started to manufacture his own products, but came up against the economic obstacle of many products that are more beneficial to the environment in the long term. Customers simply prefer the lowest cost product compared to products that protect the environment. 80% of the Biofase products - created by a daily input of 15 tons of avocado pits - are currently exported to the United States, Canada, Costa Rica, Colombia and Peru. Its main customers are chain restaurants such as Fiesta Americana, P. F. Chang’s and Chili’s Grill & Bar. For more information on Biofase, visit here.